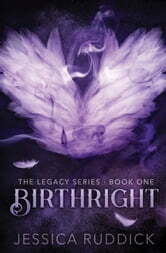 Birthright is the first book in the Legacy series by Jessica Ruddick. The concept of having to name someone to be killed as part of your function as a seeker is an intriguing one. Ava has to find a pure soul, one whose aura is white, and give the name of that person to her handler. Who would be comfortable with that? Especially when the only one she can find is that of Cole, a fellow student who exhibits none of the virtues of having a pure white aura, and who she finds herself falling for. The book was fast-paced, with intrigue and twists that just kept coming. Ava is full of rebellious spirit who has to deal with the consequences of her actions. I felt for her from the start. Overall, this is a nice start to this series and I would definitely be interested in continuing to read after the cliffhanger ending of the first book. This was a super good book! it was really fun reading! Enorm genoten van deel 1. origneel verhaal en spannend.